Aurangabad received 48 mms overnight. Nasik broken the all time 24hrs highest rainfall for Aug month of 168mm which was recorded in Aug 1968 !! Seasonal total stands on 820mm till 8.30pm.. The all time record for august was on 6th August 1968 - 168 mm. This is broken. The all time record for any month for Nasik was recorded on 2nd July 1941 - 215 mm.This record is going to be broken today as we have 12 more hours till tomorrow 8.30 am. 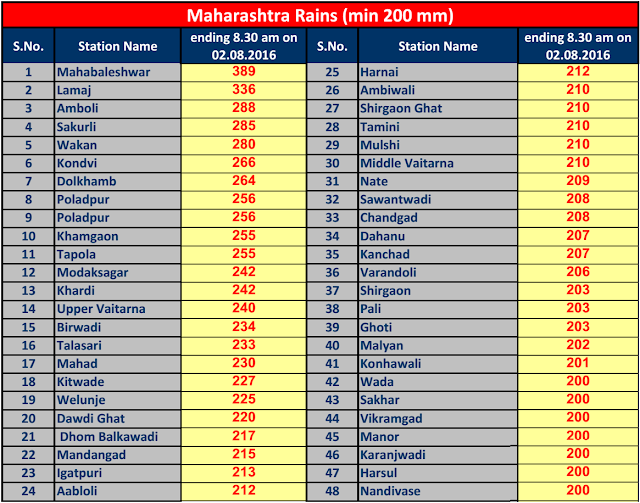 Thane recorded 210 mms till 1st Morning and 108 mms till 2nd Morning. Mahableshwar measured 390 mms overnight and 212 mms again on Tuesday in the day. Rajesh sir,as from now rain is going to reduce gradually.But,I demand that you please post your views for konkan and mumbai region in the second half of your season?will it be surplus or deficient?Let it be tentative but let us know your views regarding our region or the other parts in aug-sep-oct.please sir reply according to my expectations.Thanks in advance. Readers here are blessed with genuine rainfall figures being reported as promptly as it could be done. Appreciating efforts of all involved in data compilation, reporting and taking great effort to make this blog leader in authencity timeliness and usefulness. Approximately 413,000 million litres added since last week. Or about 120 days of supply. Mahabaleshwar cranking it out now. 410mm for today. 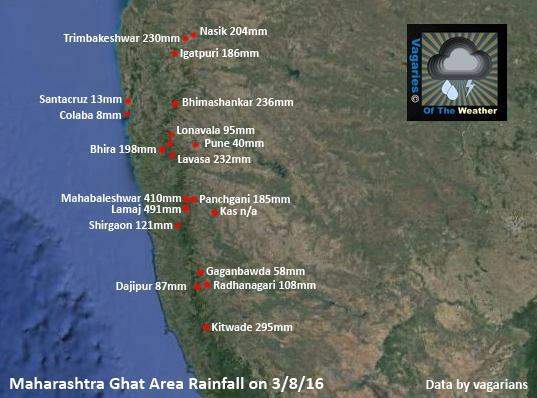 But the rainfall figures have seriously gone down for the past few days on the west coast south of Goa. No sign of the west coast trough extending all the way down to Kerala in the coming days. Don't know how long this is going to last. Not only has Pradeep compiled rainfall data for Mumbai/Navi Mumbai/Thane suburbs but also MAHA areas... with great precision. When will monsoon revive over KAR, Kerala (coastal areas are in dry state) guess this is first time rains have eluded for such a long duration? southern TN some areas touch 40c... long wait for NEM.. Totally agree with what Nilay has said. Nowhere do we come across figures given with this accuracy and speed (whether offline or on the web). Have always wondered why should this be so (in the age of technology)... why should we rely on newspaper-printed forecasts alone. Hence, appreciate Vagaries a lot and no wonder then, that since a few years it's become my daily site to visit (especially during the monsoons). Nasik gets dump of another 200mm! - taking total to 1000mm. Guess this is weird natures pattern. very weak monsoon over coastal KAR / KERALA. Augumbe defecit crosses -1000mm mark day by day increasing- cauvery (lifeline for south) is a big question? I haven't seen the rainfall figures for stations the ghat areas in Karnataka and northern Kerala. But my gut feel looking at Agumbe and Wayanad is that these areas have seen a reduced rainfall. sset: Agumbe is in the Krishna basin. Cauvery basin extends south of Mudigere and Chickmagluru. Your concern is not unfounded in that any rain deficit in the ghats south of Mudigere up to the Nilgiris can potentially lead to a shortage in the Cauvery basin. However, the overall monsoon deficit till yesterday for Cauvery basin was only 12% as per IMD. So, I'm guessing the other areas in the Cauvery basin (the Deccan plateau and Tamil Nadu plains part) are doing relatively fine.